Band mixes up music based on the crowd. Los Lobos admits to playing music that’s all over the map. 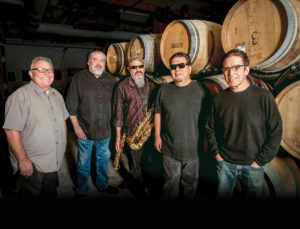 From rock, Tex-Mex, country, R&B, traditional Spanish and folk music, Los Lobos prefers genre blending — adapting to the crowd’s musical preferences. And it works. More than 40 years later, the band continues to entertain its fans with a vast set list. Listeners can catch Los Lobos at Hoyt Sherman Place on Sept. 27. The band, formed in 1973, earned three Grammys, including a best Mexican American music performance. Their signature song and album, “La Bamba,” released in 1987, along with the “La Bamba” movie, featuring the life of deceased singer Ritchie Valens, earned them a No. 1 single. The band is no stranger to Iowa venues. They’ve performed at the Surf Ballroom in Clear Lake, where Ritchie Valens played his last concert before dying in a plane crash along with Buddy Holly and the Big Bopper. CITYVIEW spoke to Steve Berlin, saxophonist and keyboardist for Los Lobos, about their performance in Iowa. He says performing at the Surf was memorable. Berlin notices their concert audiences are an interesting mix of cultures. During concerts, Los Lobos performs songs in both English and Spanish, but not necessarily all in one language. The band is in its fifth decade of playing together. Berlin reflects on the band’s secret to success. “The band took seven years getting established and honing their craft. The guys matured, and that makes us a little more tough. When success finally came to us, it didn’t change us,” he says. Another reason for the band’s longevity is they trust their instincts when it comes to musical decisions. “We learned we should keep our own counsel,” he says. “We got good and bad advice, and once we kept decisions within the band, it served us well,” he says. The band averages more than 100 concerts a year and has played in nearly every state. They performed for both former presidents Bill Clinton and Barack Obama in the White House. “We’re very lucky we’ve gotten to go all over the world to perform and haven’t compromised anything,” he says. Each concert is different, varying with the audience, so music changes from night to night. Berlin looks forward to returning to Des Moines this fall.